There is very little evidence for the psychopharmacological treatment of NSSI and eating disorders and no evidence for the treatment of a combination of both. 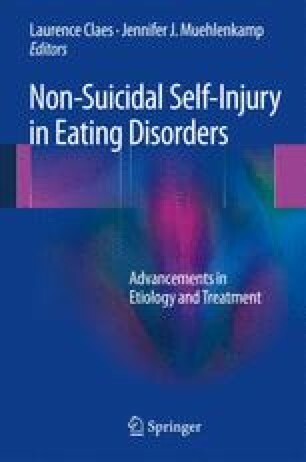 However, often patients with NSSI and eating disorders present with comparable problems with regard to emotional dysregulation, the need to control urges (e.g., to cut or to binge or purge), and the need to treat comorbid mental disorders or psychiatric symptoms such as depression or anxiety. Based on the recent literature, this chapter aims to summarize the available literature and give recommendations for the psychopharmacological treatment of these conditions. Due to the limited evidence that is available for this kind of treatment, we strongly recommend to use psychopharmacological treatment only in addition to psychotherapeutic interventions. Hawton, K., Townsend, E., Arensmann, E., Gunnel, D., Hazell, P., House, A., & van Heeringen, K. (2009). Psychosocial and pharmacological treatments for deliberate self harm. Cochrane Database of Systematic Reviews, 1999(4). Art. No. : CD001764. doi: 10.1002/14651858.CD001764.